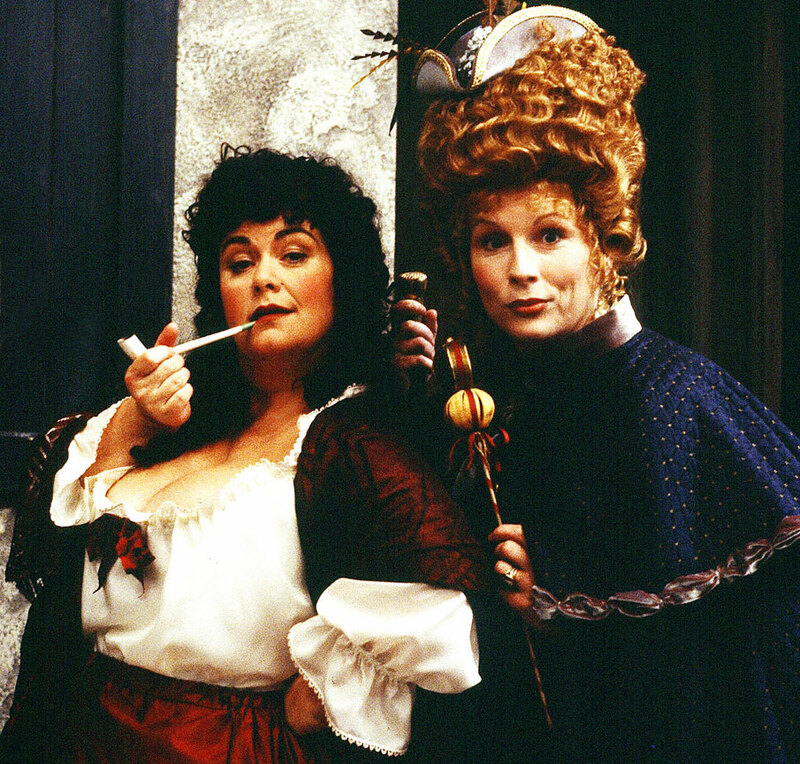 Although Jennifer Saunders didn’t actually mention the sitcom Let Them Eat Cake (1999) in her memoir Bonkers, reading it did inspire me to finally get around to buying this series on DVD, as part of my ongoing arm-chair exploration of the 18th Century. This short-lived series sees Saunders playing ‘Colombine de Vache’, a conniving Comtesse residing in the Palace of Versailles circa 1782, where she finds herself enjoying and/or enduring various farcical misadventures, along with her bawdy maid ‘Lisette’ (Dawn French), and snooty stylist ‘Bouffant’ (Adrian Scarborough). Alison Steadman co-stars as Columbine’s detested nemesis ‘Madame de Plonge’, accompanied by Lucy Punch as her naive daughter ‘Eveline’, while Elizabeth Berrington has a recurring role as the Austrian-accented ‘Marie Antoinette’ (aided by Julian Rhind-Tutt as her tetchy translator). The supporting cast also included Maggie Steed as an acclaimed portrait painter (ep #1.3)… Susie Lindeman as a random Marquise fretting over her reputation (ep #1.4)… Kathy Burke as Colombine’s estranged sister ‘Cecile’ (ep #1.4)… plus Linda Spurrier and Margaret Whiting as two excitable ‘Aristocratic Women’ (Eps #1.2/4/6). Bless ’em. Fun fact: This was one of Punch’s first professional gigs after leaving college, and working with French & Saunders was a formative experience for the young actress, according to an interview she gave to The L.A. Times in 2011: “They had a total lack of vanity and embarrassment in the name of comedy, and I think I learned that from them… I’m not ashamed to look like a total idiot.” So, apparently we have Cake to thank for all of her gloriously unhinged comedy performances since then! Hurrah! Of course, the shadow of Blackadder looms large over this series (particularly Blackadder the Third, which is set in roughly the same period), and it’s impossible not to compare the two… I think Cake is probably a little more juvenile than its forebear, with characters self-consciously mangling the French language and making winking references to “these times” to underline the fact that they’re just modern English comedians mucking about in costume… it’s also rather more racy and grotesque (the second episode, appropriately titled “Murder”, is particularly bloody), but seemed to have a much higher budget, if the gorgeous faux-exterior set used for the “poor part of town” is any indication (I do love the sight of a Tudor-style half-timbered building on screen!). Cake might not be quite as painstakingly crafted and quotable as Blackadder was, but I still found it extremely funny, and would gladly recommend it to anyone who enjoys a slightly silly/dirty laugh… it’s just a shame that it seems to have fallen through the cracks, and been forgotten by both the BBC, and one of its headline stars! P.S. The “song” that plays over the closing credits kinda sounds like the Mediaeval Baebes having a breakdown… but I mean that as a compliment! This entry was posted in Rants about TV and tagged Alison Steadman, Blackadder, Dawn French, Elizabeth Berrington, Jennifer Saunders, Kathy Burke, Let Them Eat Cake, Linda Spurrier, Lucy Punch, Maggie Steed, Margaret Whiting, Marie Antoinette, Mediæval Bæbes, Susie Lindeman. Bookmark the permalink.